What a terrific idea to use a special tile in a small area, it's cost effective, yet makes a big splash. NIce - I love the monotone look for small bathrooms. 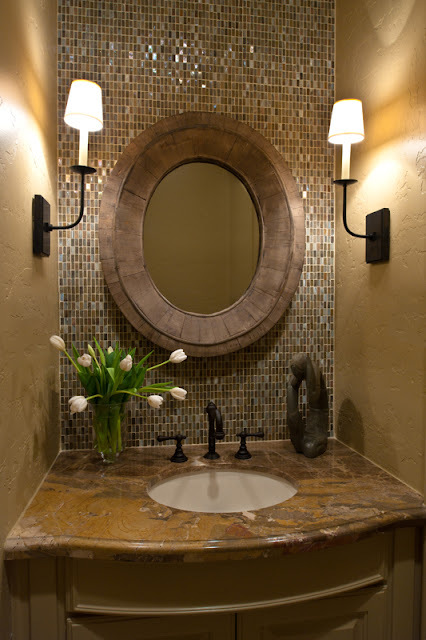 Carla, Beautiful and exquisite.Love the tile, the mirror, the sconces....all of it. A tiny jewel. Carla, gorgeous! You have a great blog and I always enjoy reading what you have to say. Love those sconces...great balance of pretty and solid. Love to see it in person. Just wanted to let you know that I am passing on the Versatile Blogger Award to you! Wow, what a wonderful transformation. I know the home owners must be thrilled. Have a great weekend! I love the outcome of the bathroom. Such a great idea to use tiles on one wall as an accent! ooooh! I love the shiny sparkly tile...and the great sconces. Lovely, all of it! I found your blog and this beautiful makeover via Maureen - I love what you did with this bathroom!!! I love the tile and the sconces. Beautifully done! I found this image on pinterest & couldn't rest until I found the original! Beautiful! I'm so glad I found your blog, this is very enjoyable! Absolutely love this powder room. Is the vanity 36 inches across? Also where did the vanity come from? Can you tell I'm trying to copy this look. Thanks for sharing. Again love it. That is beautiful. Love the tile and that mirror. What a beautiful transformation! The tile and mirror are to die for! Thanks for sharing with us this week! Wallpaper - Yes, It's In Style!